Be Kind You Can't Rewind is a 45 min. program about being kind to others the first time because you can't rewind and do your actions or words over again. Even if you say you are sorry it doesn't erase the actions or words. Children will love the message and the fun songs involved in the program. "Be Kind You Can't Rewind"
language used with this song. what you say or do is very mean. "Thumbs Down to Putdowns" - A song that encourages children to not put down other kids. some tips on what to do. "The Person I Want to Be" - A song that the kids take a pledge that being nice and kind is the type of person that they want to be. 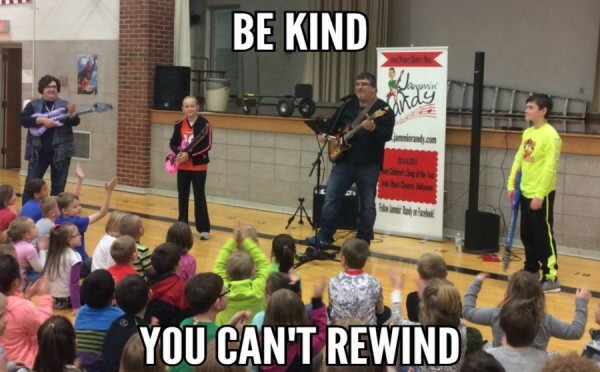 Be Kind You Can't Rewind - Writing activity. A Hero Story - Journal writing activity worksheet. Take a Walk In My Shoes - Lesson plan/Skit activity. My programs always begin and end with some of my Award Winning dance songs! All 7 song files, worksheets and poster!! This program is also for Youth Church Programs. A couple of other songs are added like this song "The Golden Rule"